Could YOU bear to live in a family commune? Ask any person on the ‘wrong’ side of 70 what they fear most about old age, and top of the list has to be loneliness and isolation. Never hearing the sound of someone else’s key in the door at night. Never seeing another coffee cup in the sink or hearing footsteps overhead. Never seeing another coat on the stand or shoes kicked on the doormat. But Neil Dowding and his wife Sandra don’t have to worry about that. Their coat stand is groaning with coats of all shapes and sizes — three generations’ worth, in fact. And with this, the retired district nurse believes he may have stumbled on the answer to Britain’s spiralling crisis in care for the elderly. Instead of downsizing or moving into a care home as he enters his twilight years, Neil has upsized by buying a small working farm near Chard, in Somerset, and setting up a family commune. Under this roof live Neil, 71, Sandra, 69, their 48-year-old daughter, Melissa, and her 53-year-old husband, Andrew Marsh. A youthful element is made up of Melissa’s children, Annelise, 23, and Ione, 21, and Annelise’s fiance, Aaron Jenkins, a 23-year-old farmer. 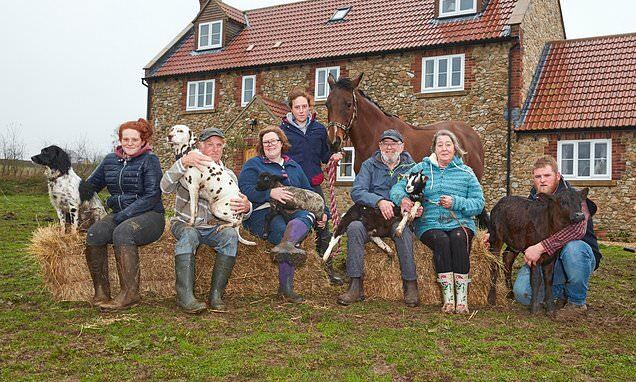 The family live cheek-by-jowl with 60 sheep, 13 horses, four milking cows and a Hereford bull called Prince. Added to that are seven dogs — Millie, Pip, Bella, Travis, Spud, Rupert and Malarchy —seven Gloucester Old Spots pigs, a rescue calf called Rosie, 11 ducks, three bantam hens, two rabbits and a couple of fish. ‘It’s a bit of a madhouse,’ says Neil, who without a doubt is the patriarch of the clan, ‘but our different ages are a strength, not a source of conflict.